Having learned the art of writing, I am able to tell this story so that others may know of our historyI am Serena, the sister of Romulus and Remus. With this prologue, Serena begins a spellbinding tale of the founding of Rome. It is not the popular legend, but an elaborate historical fantasy that blends adventure, mythology, and our knowledge of ancient Italy. The beautiful yet malevolent goddess Discordia, who was responsible for the Trojan War, chooses as her next victims the people of a village near Alba Longa in central Italy. Her meddling compels the teenagers of the tribeincluding the twins Romulus and Remusto leave their home in order to save the other villagers. As they search for a place to live, Discordia continues to plague the Albans. They are ceaselessly challenged by supernatural forces, including an eruption of Vesuvius, a whirlpool caused by Karybdis, and encounters with shapeshifters, the soul-devouring Keres, and ghastly Harpies. During their journey, the Albans are aided by some of the immortals, who admire the determination of the teens. Among the immortals is Aeneas, who leads them briefly through the Underworld. They are not so fortunate in their dealings with the Etruscans, some of whom are in the thrall of Discordia. Always at the side of Romulus and Remus is a great white dog, Nivea, who is the source of the rumor that the twins were raised by a wolf. Nivea possesses mysterious powers and is able to communicate with mythical creature like centaurs and a sea serpent who saves all of them. The Albans eventually arrive at a place near the Tiber River where a struggling village welcomes them and omens suggest that this should be their new home. Discordia, however, has other plans, an ultimate confrontation takes place, and Niveas true identify is revealed. Dr. Michael Milone is a nationally recognized research psychologist and award-winning educational writer who earned a Ph.D. from The Ohio State University in 1978. He has been involved in the development of some of the most successful assessments and curriculum materials in education produced by publishers that include Academic Therapy Publications, Highlights for Children, McGraw-Hill Education, MindPlay, Renaissance Learning, Scholastic, and Harcourt Educational Measurement. As a grandson of Italian immigrants, Dr. Milone grew up learning the stories of his ancestors, including the classical legends. His interest in antiquity prompted a book chapter on the history of handwriting as well as his first two novels, Nasha: The First Dog and Return of the Lion People. 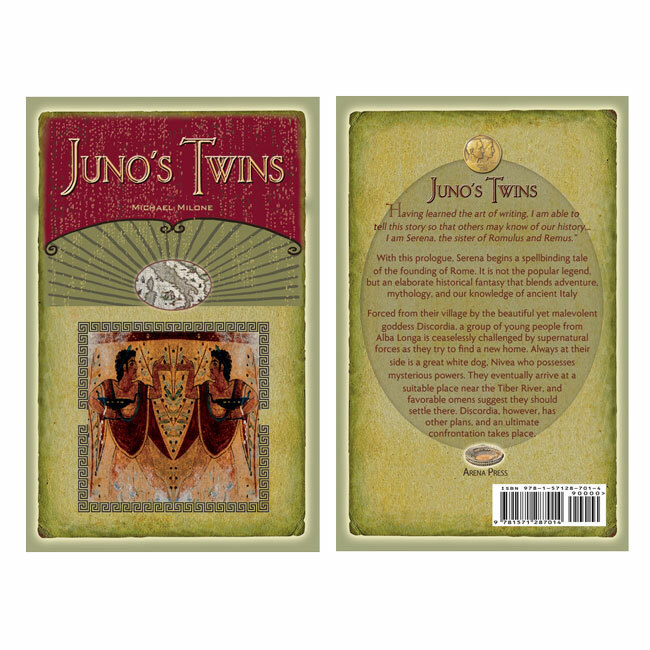 Writing the historical fantasy Junos Twins, which is based on the Romulus and Remus story, was a natural extension of his interest. A frequent visitor to Italy for biking and hiking adventures, Dr. Milone has visited many of the locations featured in Junos Twins. He has completed two Ironman triathlons and 33 marathons, including Rome. A first-person retelling of the founding of Rome. 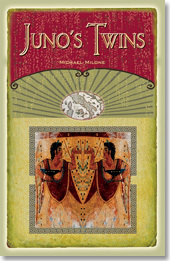 Milone (Nasha: The First Dog, 2009) tells the story of the twins Romulus and Remus through their sister, Serena. The goddess Discordia sets her sights on disrupting the lives of Serenas people and sends an attack on their town that forces Serena, her twin brothers and a group of other children out into the Italian wilderness. With the guidance and aid of their dog, Nivea, the group faces attackers, natural disasters and various mythical beasts on their quest, eventually coming to settle the city of Rome. In a Q-and-A in the back of the book, Milone informs the reader that he decided to reinvent the well-known story to find another way to look at its gruesome end, and while the story still ends in tragedy, it feels more accessible and emotionally satisfying than the myth. The book is geared toward young-adult audiences, and as such, its full of snippets of Latin vocabulary, information about ancient history and examples of mythical creatures that would make it good companion reading for a variety of middle school classes. Milone has an education background, and this comes through in the clear sentences and clean plot that make the novel accessible.